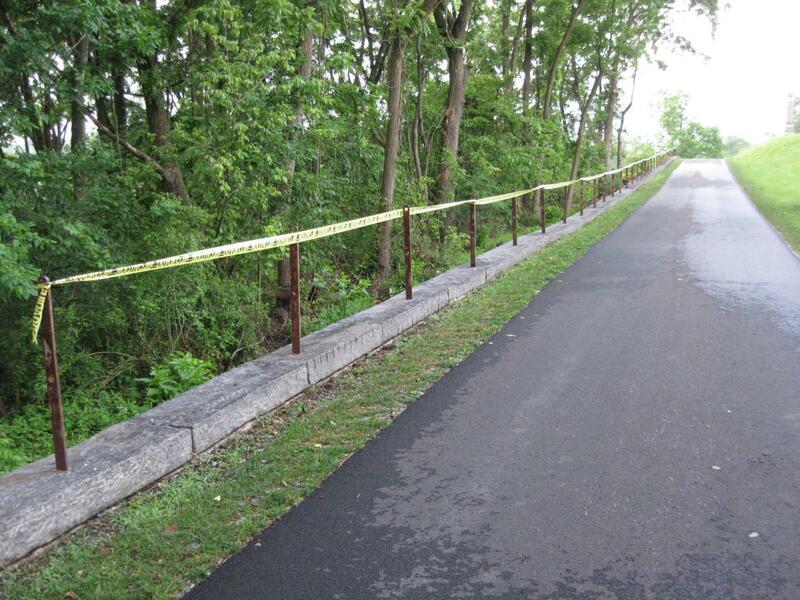 The retaining wall along Wainwright Avenue is being reconstructed/repointed. The work on the wall has revealed more of Brickyard Lane (to the left of the wall) than has been revealed in recent memory.This view was taken facing southeast at approximately 8:00 AM on Friday, June 17, 2011. 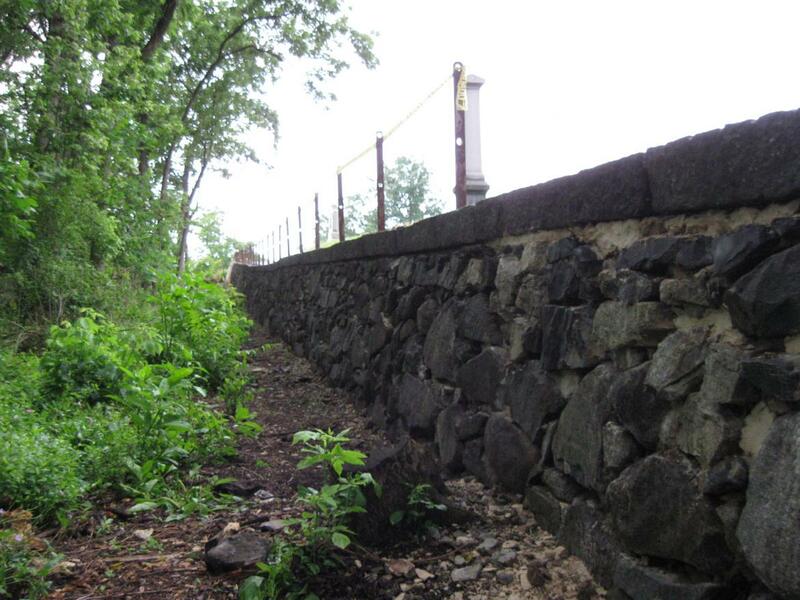 The retaining wall along Wainwright Avenue is being reconstructed/repointed. The work on the wall has revealed more of Brickyard Lane than has been revealed in recent memory. This photograph by William Tipton in the early 1900s shows the recently constructed Wainwright Avenue. 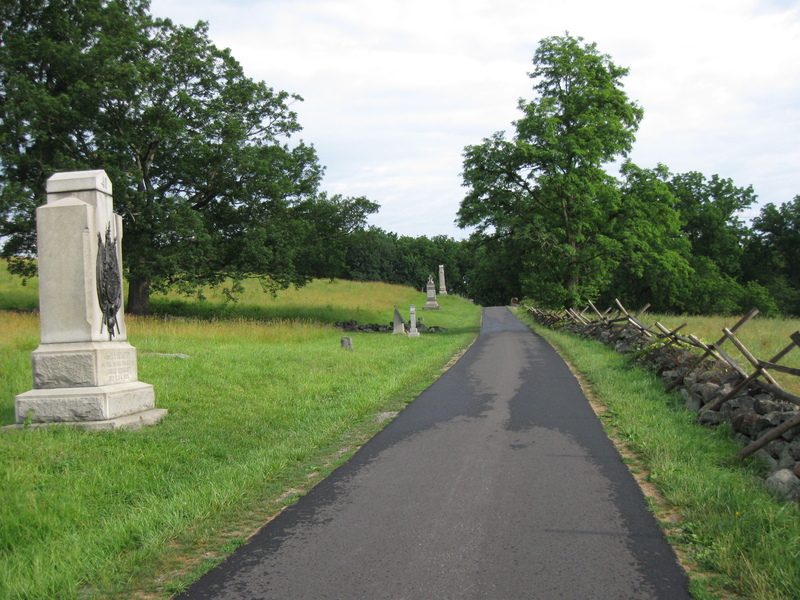 The 17th Connecticut Monument is to the right of Wainwright Avenue and behind it is the monument to the 54th New York Infantry Regiment. 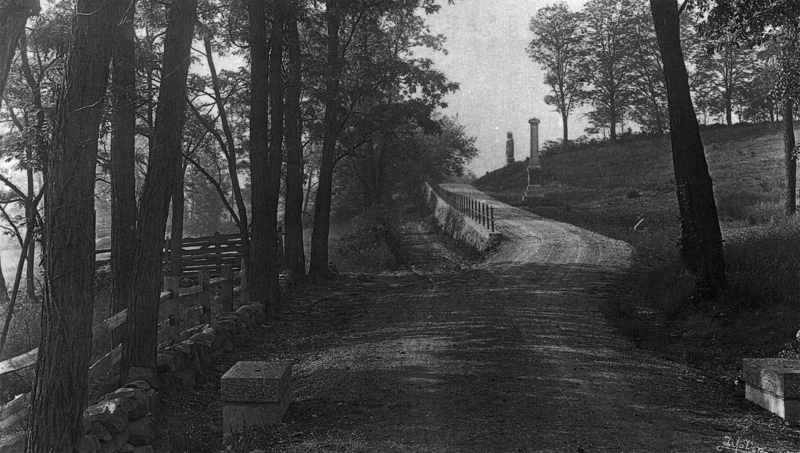 Brickyard Lane is to the left of Wright Avenue and to the left of the retaining wall.This view was taken facing southeast circa the early 1900s. 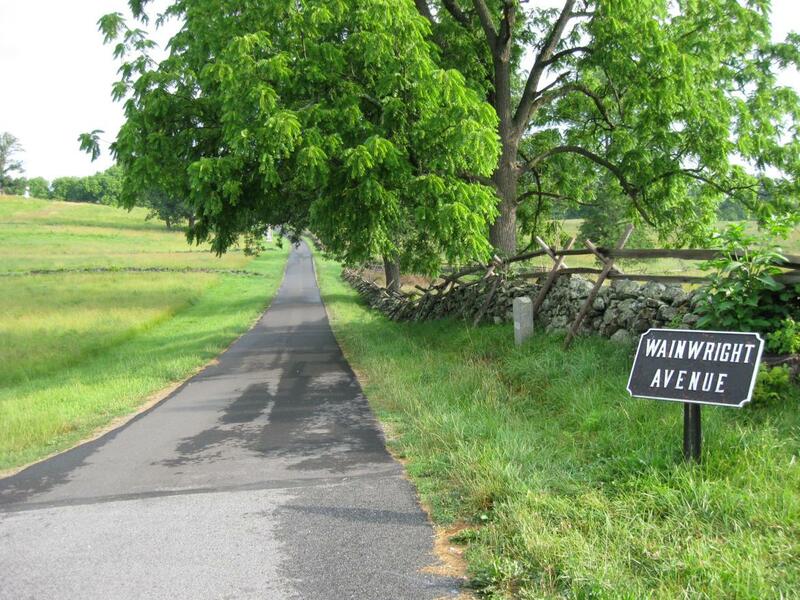 Wainwright Avenue and the old Brickyard Lane are located on the east slope of East Cemetery Hill.This view was taken facing southeast at approximately 8:00 AM on Friday, June 17, 2011. 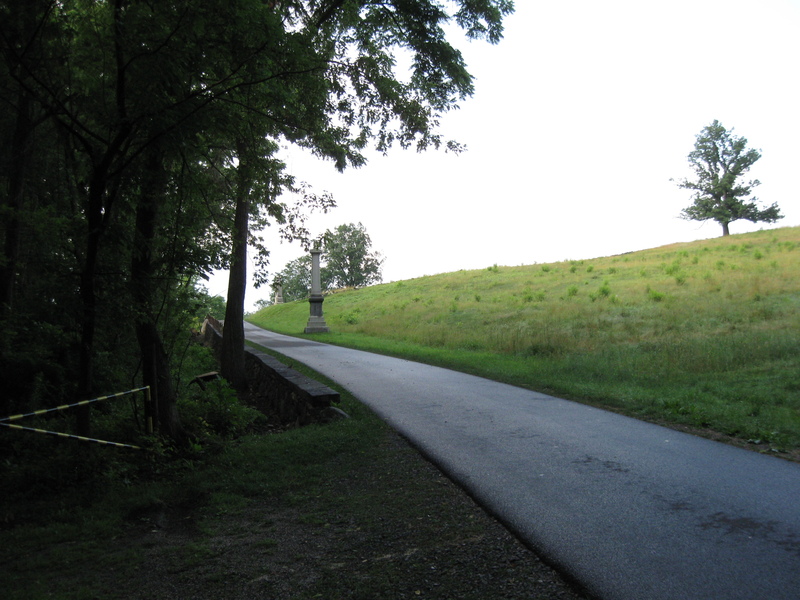 The last photographs were taken where Brickyard Lane and Wainwright Avenue are located near the monument to the 25th and 75th Ohio Infantry Regiments.This view was taken facing south at approximately 8:00 AM on Friday, June 17, 2011. 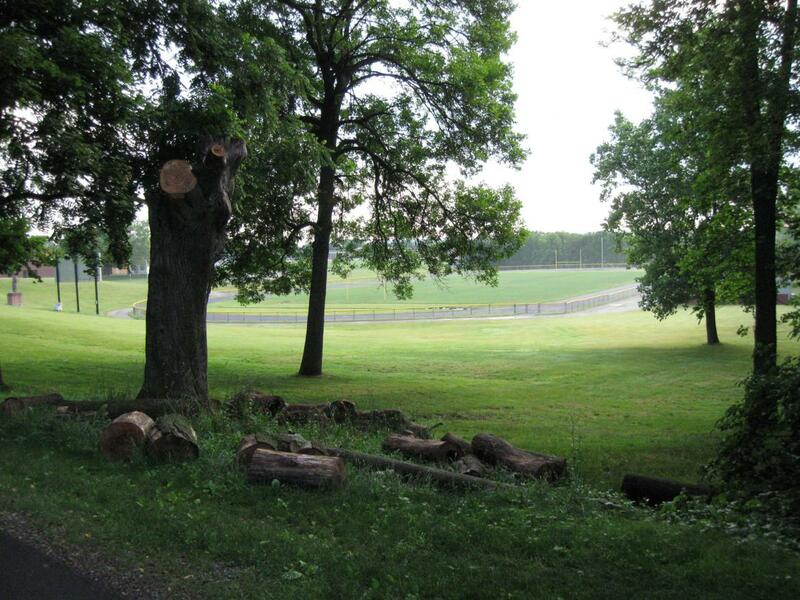 This area also overlooks the Gettysburg High School football field. 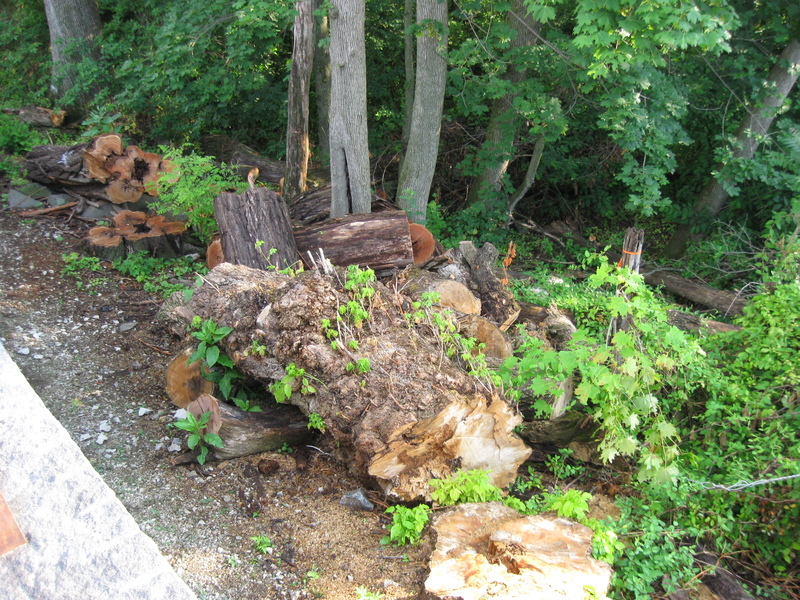 Notice how the tree has been cut up.This view was taken facing north at approximately 8:00 AM on Friday, June 17, 2011. 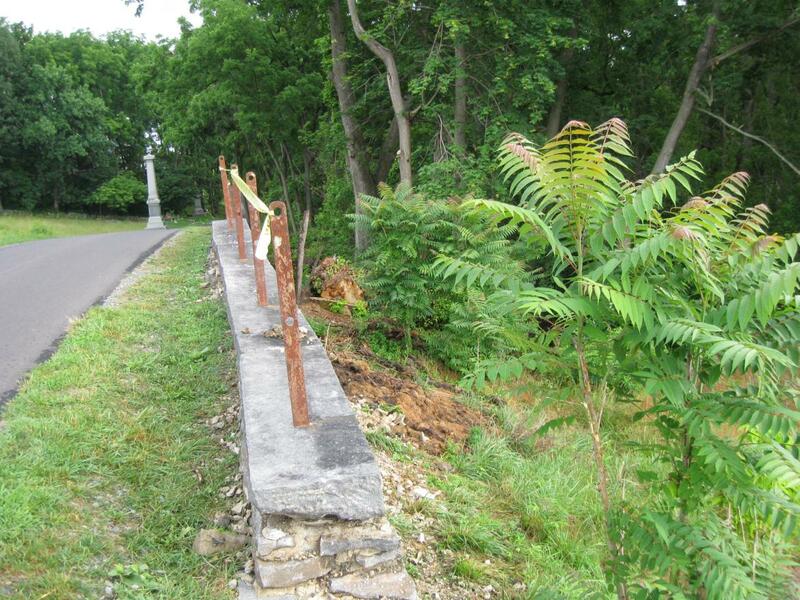 Part of the work on the retaining wall involves replacing the iron or lead or steel fence that was on top of the wall.This view was taken facing southeast at approximately 8:00 AM on Friday, June 17, 2011. Here are some of the fence posts that are still remaining.This view was taken facing southwest at approximately 8:00 AM on Friday, June 17, 2011. 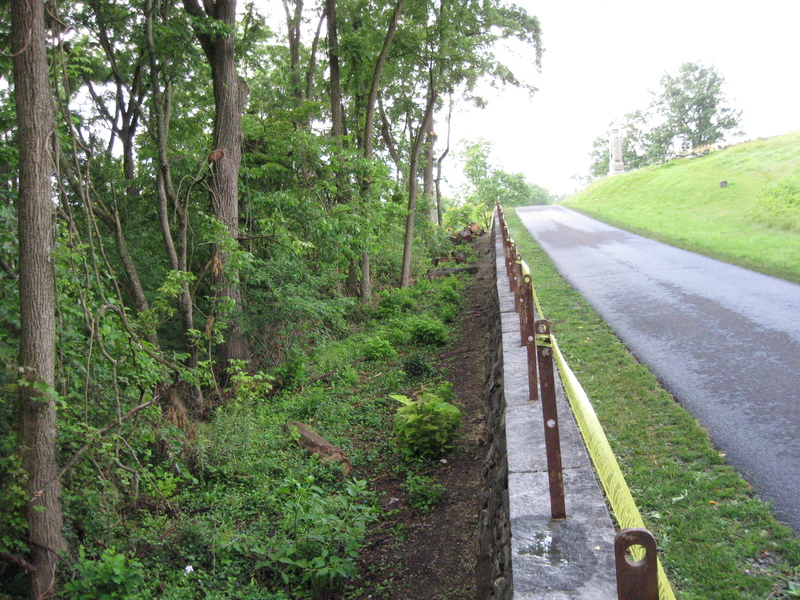 Part of the work on the retaining wall involved cutting away the trees and bushes near the wall so the workers could do their job.This view was taken facing southeast at approximately 8:00 AM on Friday, June 17, 2011. You will have to take our word for it in this photograph, but from the bottom of the picture to the larger tree in the center is the road bed for Brickyard Lane.This view was taken facing northeast at approximately 8:00 AM on Friday, June 17, 2011. We’ll show it to you from another angle. From the retaining wall to the trees on the right is the road bed for Brickyard Lane.This view was taken facing northwest at approximately 8:00 AM on Friday, June 17. We have moved closer to Stevens Knoll/McKnight’s Hill. Slocum Avenue is behind the camera. Brickyard Lane was located close to Wainwright Avenue in this area, but closer to the stone wall.This view was taken facing northwest at approximately 8:00 AM on Friday, June 17, 2011. 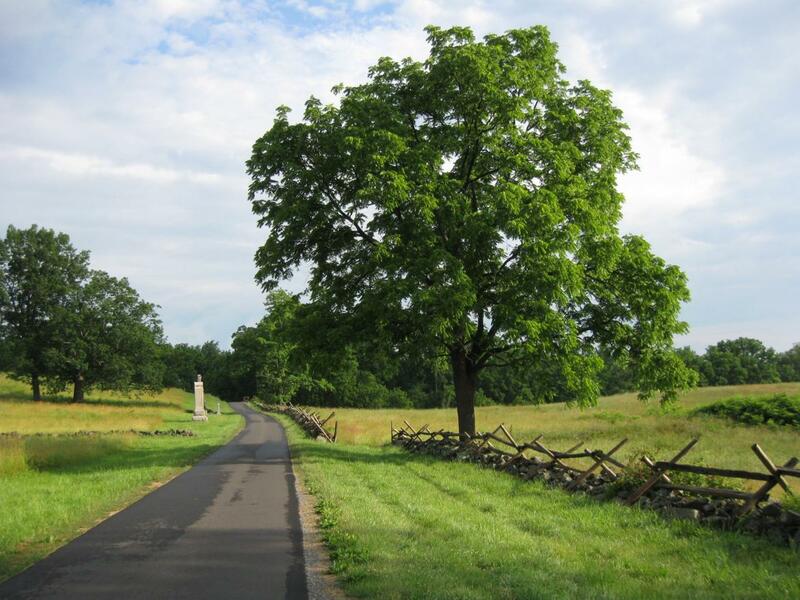 Brickyard Avenue was used at the time of the battle as an alternative route for wagons with heavy loads. 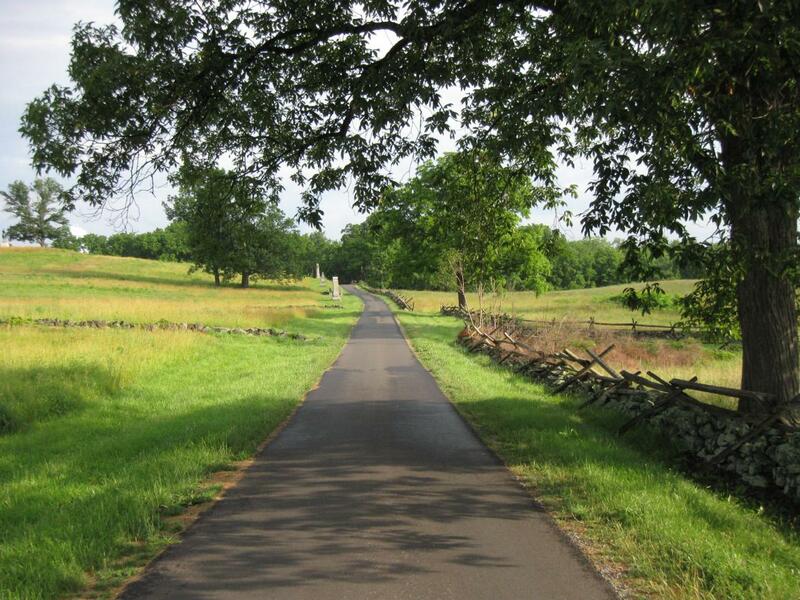 The Baltimore Pike is going over Cemetery Hill in the left background near the red brick Cemetery Gatehouse.This view was taken facing northwest at approximately 8:00 AM on Friday, June 17, 2011. Instead of going over Cemetery Hill on the Baltimore Pike, wagons could go on Brickyard Avenue which “skirted” the east side of Cemetery Hill as they made their way into the Borough of Gettysburg.This view was taken facing northwest at approximately 8:00 AM on Friday, June 17. 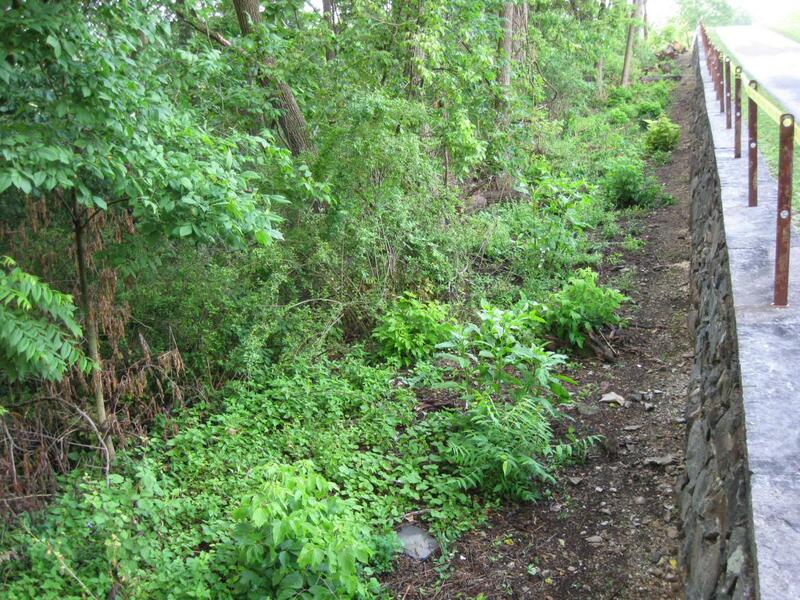 Brickyard Lane had stone walls on both sides. The one on the right or east side is still standing here on the right.This view was taken facing northwest at approximately 8:00 AM on Friday, June 17. This picture of Culp’s Hill from East Cemetery Hill shows Brickyard Lane running from right to left at the bottom of the picture. 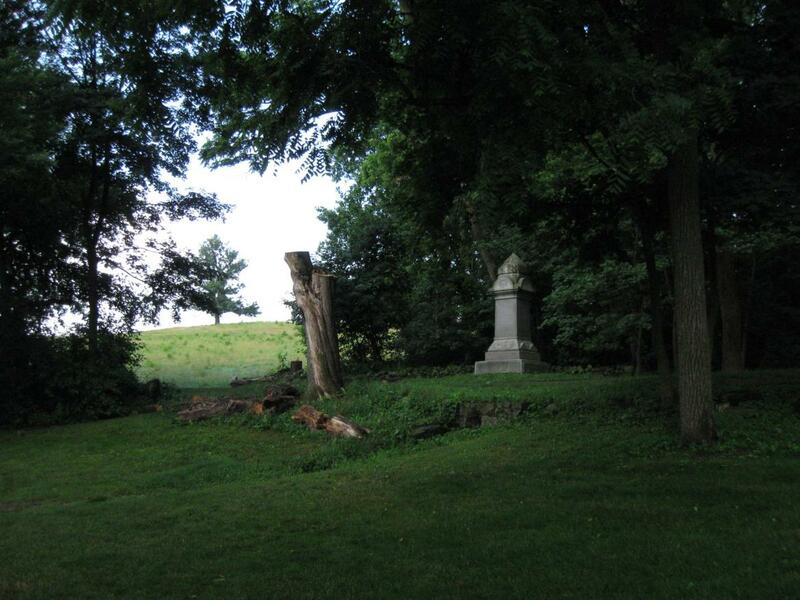 For a time, Brickyard Lane was not only used by people with heavy loads trying to avoid climbing Cemetery Hill, it was also probably used by locals to have access to the plots of land along the slopes of East Cemetery Hill that they were renting. 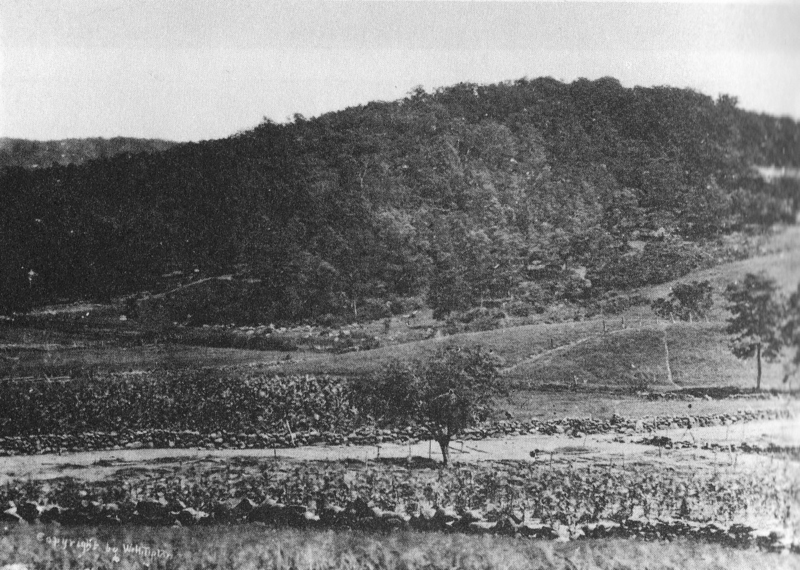 This image by the Tyson Brothers is courtesy of the National Park Service.This view was taken facing southeast in August, 1863. We are standing in the roadbed of Brickyard Lane. 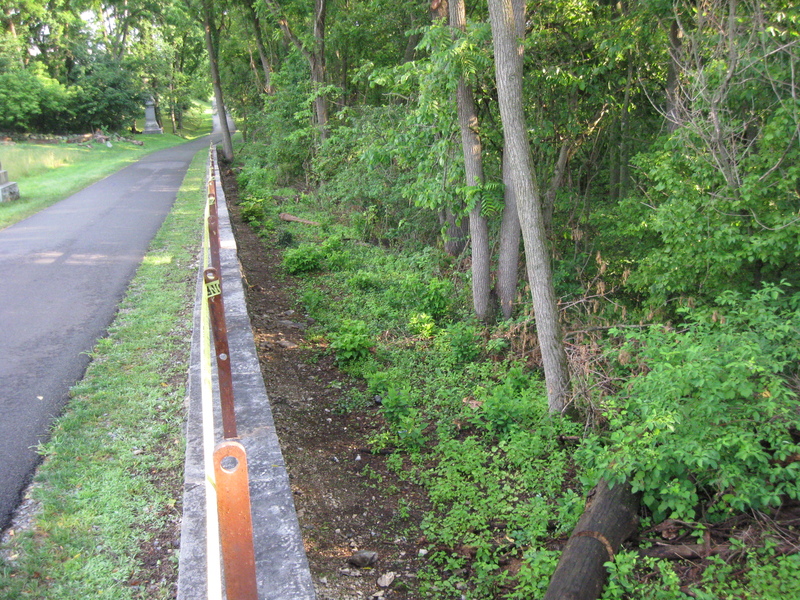 The wall on the right would have been on the east side of Brickyard Lane. The Wall on the left would have been on the west side of Brickyard Lane. Wainwright Avenue is on the left.This view was taken facing northwest at approximately 8:00 AM on Friday, June 17. 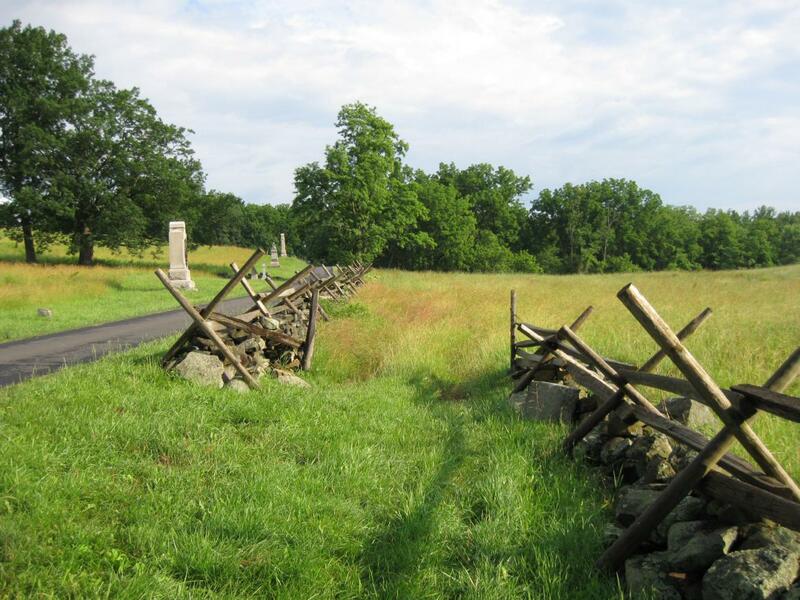 Soldiers represented by the monuments hid behind the stonewall as Confederates attacked them from right to left on the evening of July 2, 1863. 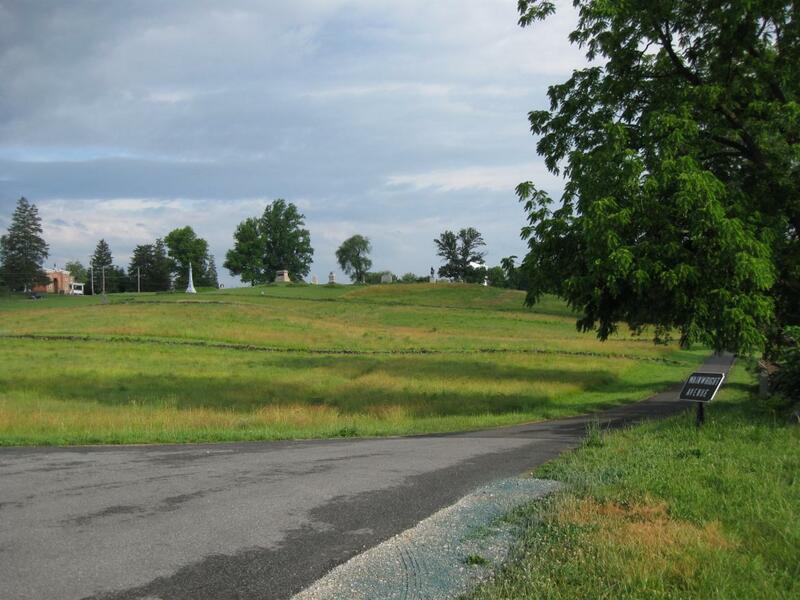 The monuments are from closest to farthest away: 41st New York, 41st New York left flank marker, 153rd Pennsylvania, Von Gilsa’s Brigade Plaque, 68th New York, and the 54th New York.This view was taken facing northwest at approximately 8:00 AM on Friday, June 17. 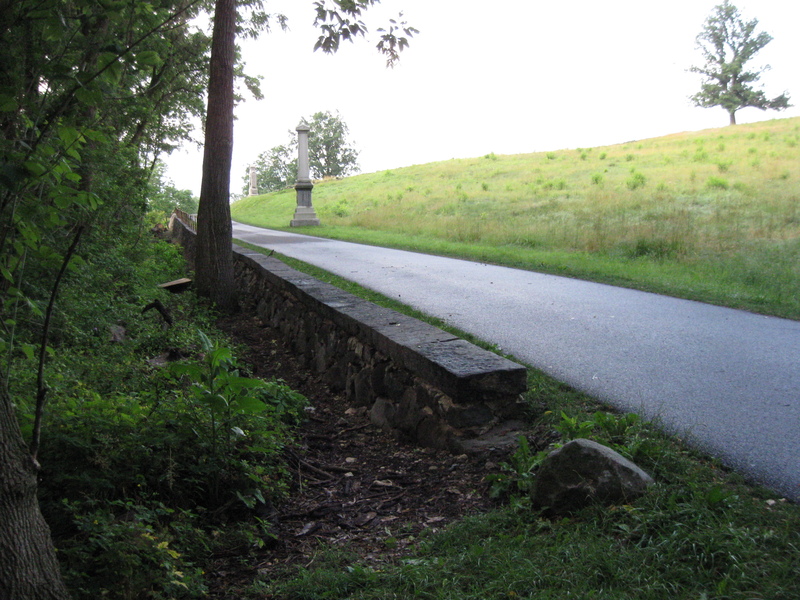 As you arrive closer to the woods the retaining wall begins, and this is the area defended by the 17th Connecticut Infantry Regiment, whose monument is in the left background.This view was taken facing northwest at approximately 8:00 AM on Friday, June 17. 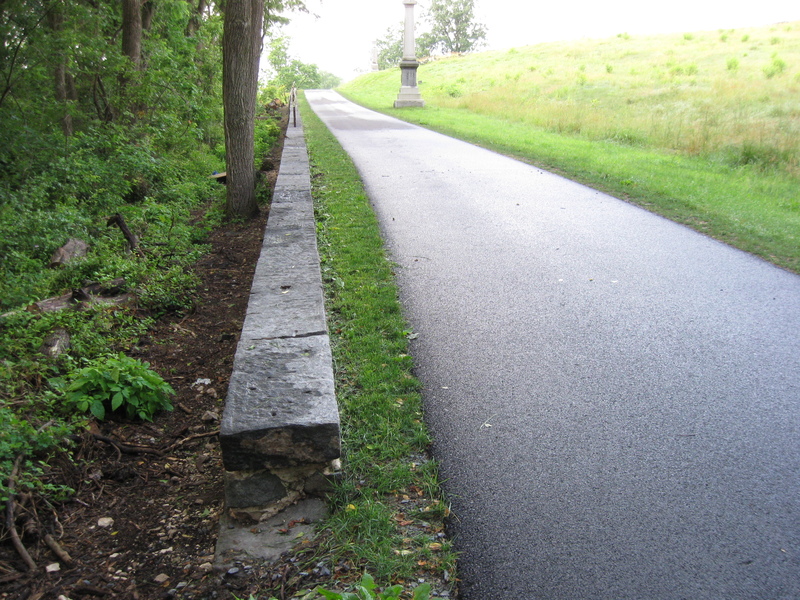 Some historians believe that stone walls from the 17th Connecticut’s position along Brickyard Lane were used to construct the retaining wall along Wainwright Avenue. This view was taken facing south at approximately 8:00 AM on Friday, June 17, 2011. 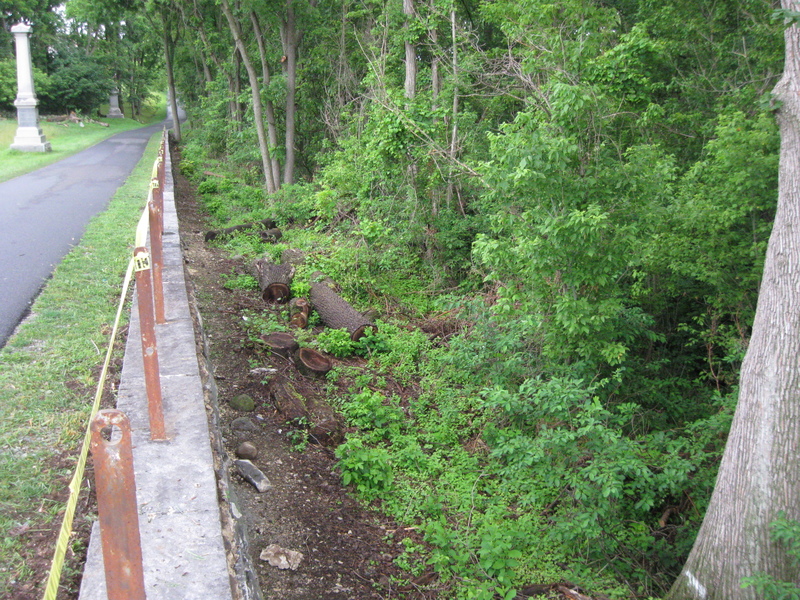 A lot of debris was removed from close to the retaining wall and expose Brickyard Lane.This view was taken facing northeast at approximately 8:00 AM on Friday, June 17. 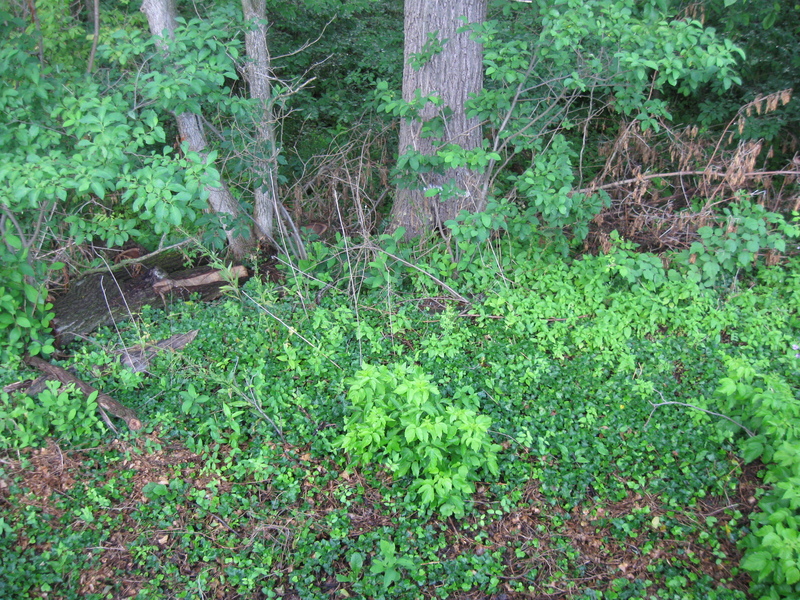 Before this area becomes completely overgrown again, take a look at old Brickyard Lane in the area occupied by the 17th Connecticut.This view was taken facing northwest at approximately 8:00 AM on Friday, June 17, 2011. It may be years before you get another chance.This view was taken facing northwest at approximately 8:00 AM on Friday, June 17, 2011.